Amazon (USA) has just put this up for pre-ordering - the three hardcover editions of The Children of Húrin, Beren and Lúthien, and The Fall of Gondolin in a boxed set presentation. I didn't actually say they should, did I (or that there was any harm)? You seem to like to reply to things that were never stated (on this and other threads). This isn't the HarperCollins or Tolkien-Estate fan club, so please don't expect it to be one. I think the comments for and against a slipcased set in this thread are valid views for collectors to have, but I would prefer we not shift comments on those views to the people holding those views. I believe in the "other thread" that was just a misunderstanding caused by quirks of the site presentation of replies. Did anyone else notice the CoH art has the reddish cast of the paperbacks? Based on the 3 HMH hardbacks it will be a thinner box than the mockup. 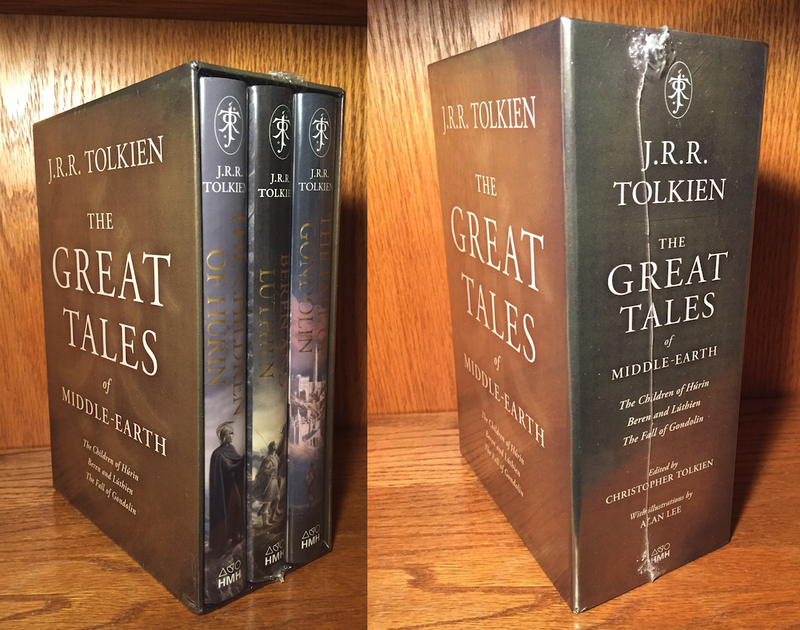 For anyone interested in this USA boxed edition of The Great Tales set of three books, Amazon currently has it discounted to $46.39 pre-order price guarantee (list is $75). Due to come out October 23rd. I have been informed by HC, that they will release a similar UK box-set in 2019. Thanks Trotter, good to know! Looks a lot better than the mockups! It does indeed, although it does showcase Alan Lee in all his glorious drabness.